2Department of clinical pathology, Faculty of medicine ,Zagazig university. Aim &Objectives: Wilms ٰ ٰ tumor 1 (Wt1) gene is over expressed in majorty of acute leukemia.The aim of this study is to evaluate(WT1) gene expression in children with acute lymphoblastic leukemia and to find out the relationship between it and other morphological, immunophenotypic and prognostic factors. 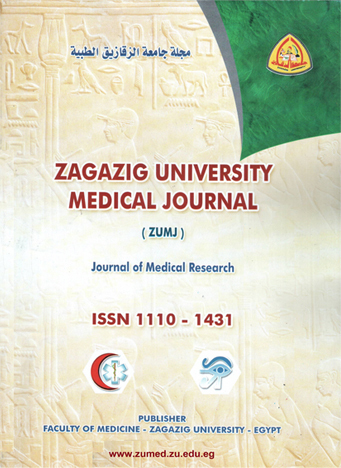 Subjects &Methods:An case-control study was conducted in pediatric Hematology & oncology unit ,zagazig university children's hospital ,zagazig university during the period of January 2011 to June 2013.we examined the level expression of (WT1) gene in 44 newly diagnosed children with acute lymphoblastic leukemia and 20 controls patient with hematological problems other than hematological malignancies. A fresh peripheral blood samples were collected patients and controls and submitted to RNA extraction, reverse transcription of extracted RNA and real-time quantitive PCR. Results:we detect a wide range of Wt1 gene expression level among 44 patients of acute lymphoblastic leukemia. Statistically, Wt1 gene expression level was significantly higher in T-cell acute lymphoblastic leukemia than in B-cell Precursor acute lymphoblastic leukemia(P<0.001) and also higher in those with expression of myeloid marker than those without expression of these markers. Analysis of relapsed cases (3/44) indicated that abnormally increase of wt1 gene expression level was associated with increased risk of relapse. Conclusion: This study suggest that Wt1 expression in childhood acute lymphoblastic leukemia is very variable and much more expressed in t cell leukemia than BCP ALL and show higher levels in relapsed patients thus indicating a possible prognostic marker of childhood acute lymphoblastic leukemia.